Agriculture has a big impact on water quality. The United States began regulating water quality in 1972 after the Cuyahoga River caught on fire, and though tremendous improvements have been made in the quality of our water since then, we are still facing problems like algal blooms. Beth Seibert, Coordinator of the Ottawa River Coalition, and Jay Begg, who has been farming all his life, told us that quite a bit of the problem comes from non-point source pollution, or water runoff from farm fields, yards and roads. Farmers have responded with best management practices like no-till farming, planting buffer strips around water ways, and being more conscious about the amount of fertilizer, herbicides and pesticides they apply. But Begg says there's still an issue and the farmers aren't sure why. "We don't exactly know how to do it. We don't understand how the phosphorus is leaving the fields, but it is." He says Ohio, Michigan and Ontario have signed an agreement to reduce the amount of phosphorous running off into Lake Erie by 40% by 2025, which is an "ambitious goal." "I don't think there's anybody who doesn't think this is a problem and nobody who doesn't want to fix it. We just want to fix it cooperatively and voluntarily and not at the end of a gun," says Begg, referring to Former Governor Kasich's executive order declaring Lake Erie a distressed watershed and requiring 7,000 farms in northwest Ohio to reduce their agricultural runoff. The order has not yet been implemented and Begg says there just isn't the time or the resources to ensure compliance. Begg says this is an ongoing discussion and in the meantime, farmers continue with their best practices. Also at Rotary, Monday, we presented a check for $723 to Crime Victim Services. This is the proceeds of last quarter's Rottery drawings. Lima City School Superintendent Jill Ackerman takes a "deep dive" into the state report card. Polio Plus Auction brought in $100 for lottery tickets donated by John Ficorilli and Tracie Sanchez. Thanks to Beth Seibert for that bid and Jay Begg for serving as today’s auctioneer. President Paul Swartz noted that there is a District Meeting planned for Feb. 22nd at Avon, Ohio. Go to the District webpage for more information. Paul Swartz also announced a local committee meeting – the Small Projects Committee. This committee is being reactivated by Ben Swartz, Adam Stolly, Jeff Dulmage and Jay Wenger. Their next meeting will be Feb. 25 at 1pm after the regular meeting. Any interested Rotary member was encouraged to join in and bring new small project ideas. Linda Hamilton, CEO of West Ohio Food Bank was presented with a $588 check from the fourth quarter Rottery proceeds. Congratulations to the nine new club members who exchanged their red badges for blue badges today: Bob Fricke, Marin Harbur, Tony Miller, Tammy Colon, Josh Parker, Rob Nelson, Jeff Dulmage, Syndi Winkler, and Nathan Garlock! Judge Richard Warren and Jesse Lowe gave an update on one of the Lima Rotary Club’s pet projects – High Octane Drumline. Jesse noted how 2018 was a rebuilding year after losing many kids to graduation and college. Their kids meet once a week for an hour and a half and are very dedicated. They are learning how to read, write, play and perform multiple music pieces. They have a full parade performance schedule for 2019. Jesse gave much credit to the dedicated parents and foster parents of his students. He also thanked the Rotary Club and the community as a whole for the donations critical to supporting this program. Judge Warren closed with acknowledgements of how Jesse and the other leaders not only serve as music instructors but also as important counselors and mentors for kids dealing with serious family and personal issues. He was adamant in stressing how these dollars we spend here at home ARE changing lives through devoted people like Jesse and organizations like the High Octane Drumline. Jill Ackerman requested assistance with the Rotary 4-Way Test Speech Contest. She needs judges, assistants, and audience members for the contest at Lima Senior High on Thursday, February 28th beginning at 6:00 pm. Contact her at jackerman@limacityschools.org to sign up. The key presenter at today’s meeting was Lima City Schools Superintendent Jill Ackerman – Lima City Schools 2017/2018 State Report Card. This report was developed by Lima City Schools as a tool to help the community and parents understand why they have received an F. She briefly spoke of how detrimental and debilitating this score can be on the consciousness of students, teachers, and community members who are working hard to support what they know to be an excellent school system. And a score of D or F for so many consecutive years holds with it the threat of having the state takeover the local school system. Lima City Schools missed the D score by only 4/100ths of a point. She broke down most of the 23 testing indicators for the audience and showed where Lima City Schools is both succeeding and challenged. Their goal has been to peel back the layers and take a deep dive in to discover the strengths and weaknesses, and obstacles and opportunities within each student, individual school, and program. Jill spoke of their “Most Vulnerable Students” and noted that 23% of their students meet the requirements of needing special education assistance because of a cognitive, speech, emotional or other such disability. They are seeing good improvements with their targeted efforts at this student group. But if they want to focus on simply bringing the overall grade card score up, initiatives and improvements within this area may have to be sacrificed through some tough decisions. Jill believes the state report card system is broken, especially as you look at the common denominators of the 20 school systems in Ohio that are considered failing – larger urban districts with higher poverty demographics. There is a direct correlation between poverty and test scores. Since the state cannot provide answers for how urban schools can improve their overall grade card, these schools have formed a collaboration to learn from one another. One of the most important next steps is for the district to focus on improving early learning and preschool. She talked about how important that brain development is from birth to age 4. If these kids enter Kindergarten unprepared or behind they are likely to lag behind their entire school career. She also reported on how they have become a center that is serving the whole student and their family by providing free breakfast, food pantries, and health services. Jill acknowledged how much the community is involved in their school district and how important and beneficial these partnerships are for Lima City Schools success. Bob Ruehl is back from Honduras where he was wrapping up our sanitation project. 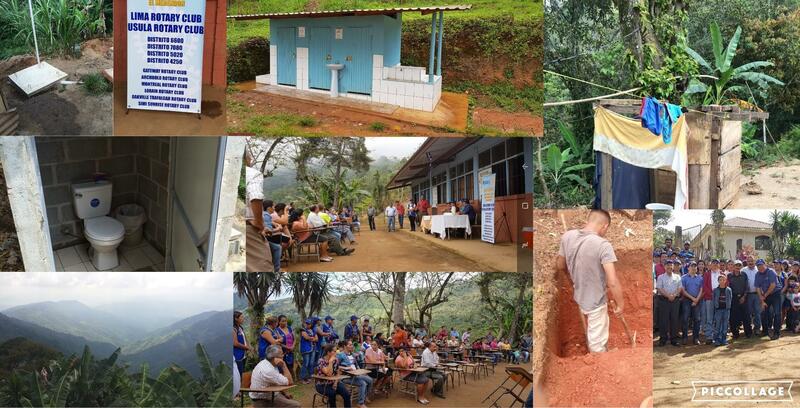 The Lima Rotary Club and its partner clubs are wrapping up work on a $200,000 global grant that improved sanitation to villagers living the mountains of Honduras. Five villages where we have worked requested a meeting with my partner and I to discuss the progress of the project. The discussion turned in to a huge thank you for the sanitation improvement. We heard from more than 80 people who all spoke one by one about the change in their family’s life. I was totally surprised and grateful for the experience. The Bath High School Interact Club continues to stay busy. On 1/25/19 - The Bath High School Interact Club hosted a “Dodge Out Drugs” dodgeball game during the Bath High School varsity boys basketball game. At half time, members of the club played a dodgeball game against teachers and staff. After the game, over 100 students stayed to play a great game of dodgeball. The goal of the activity was to remind students that there are lots of fun and enjoyable activities that do not involve drugs or alcohol. You can watch the fun here. On 1/31/18 the BHS Interact Club attended the girls varsity basketball game as a group. 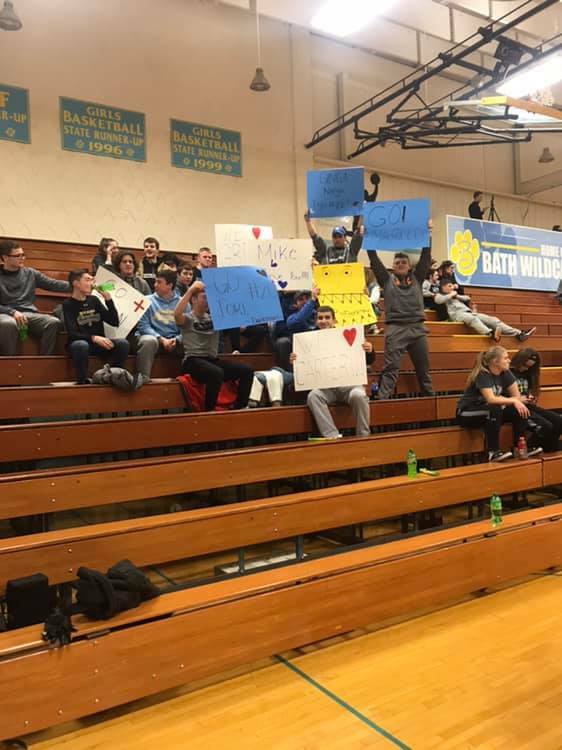 They made signs and formed a cheering section with a goal of rooting on their classmates. The goal of the club is to create unity, school spirit, and encourage the student athletes. 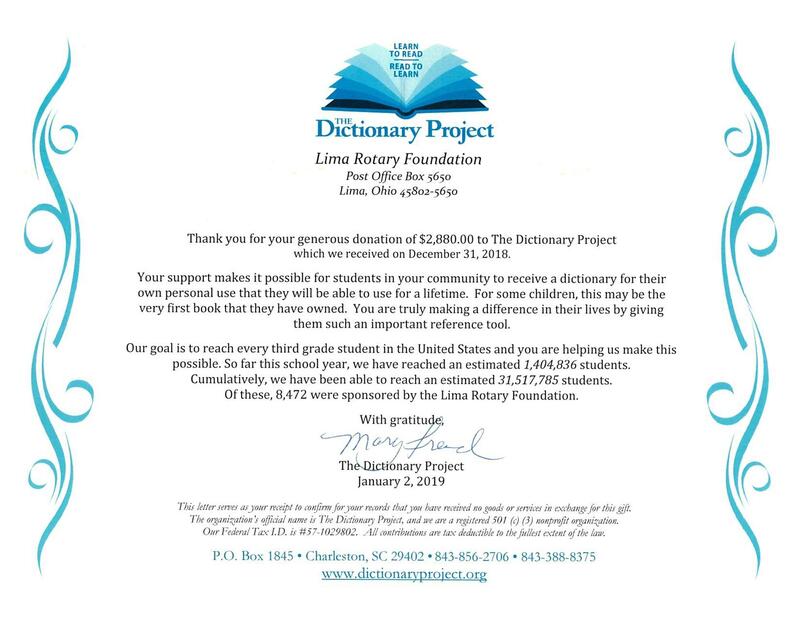 We received a nice thank you from our partners in our Dictionary Distribution. 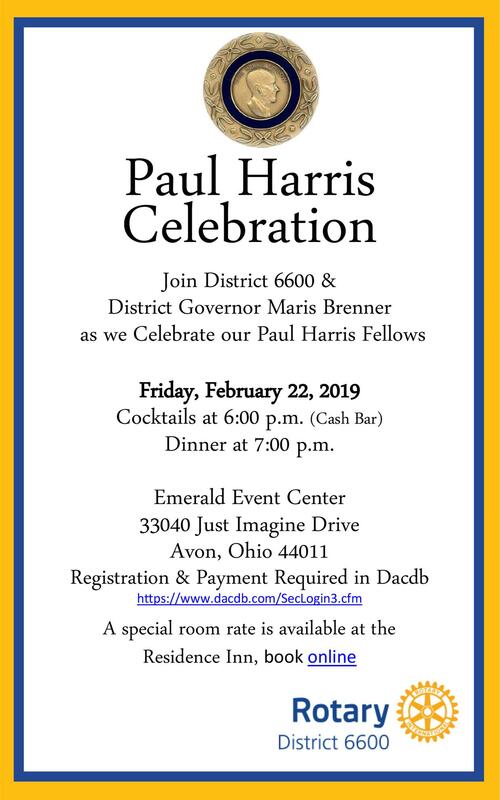 RSVP now for the District 6600 Paul Harris Dinner. Through the Rotary Foundation amazing things happen. In Afghanistan, Rotary members opened a girls’ school to break the cycle of poverty and social imbalance. Rotary members in the US partnered with ProLiteracy Detroit to recruit and train tutors after a study showed that more than half of the local adult population was functionally illiterate. Rotary members helped develop the SOUNS program in South Africa, Puerto Rico and US which teaches educators how to improve literacy by teaching children to recognize letters by sounds instead of names. And Rotarians are providing clean, fresh water to every public school in Lebanon, so students can be healthier and get a better education! 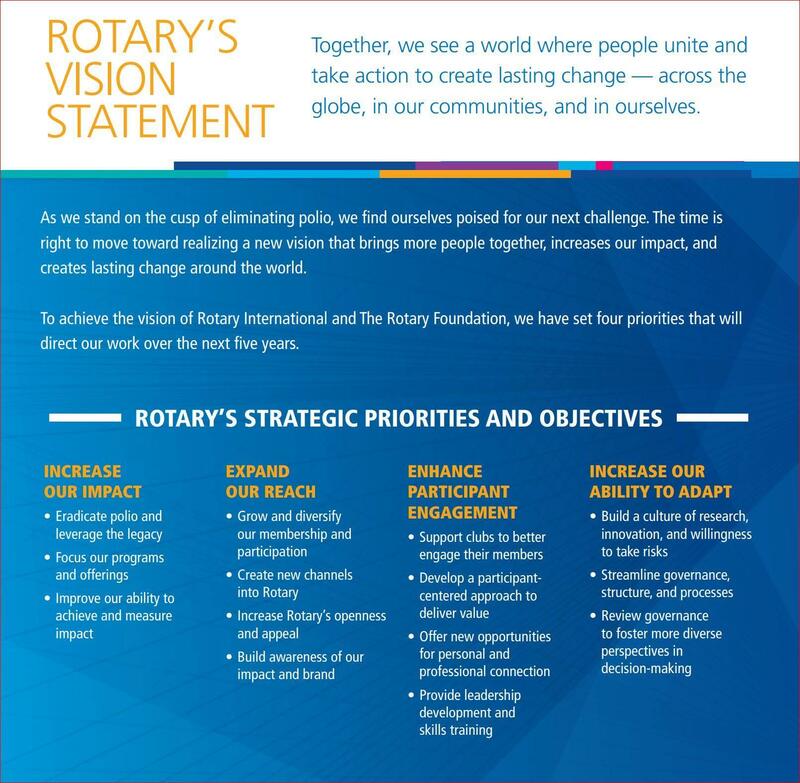 Be inspired by Rotary's vision statement.